Robert Hooke in 1665 observed slices of cork under a simple magnifying device. Cork is a part of the bark of a tree. He took thin slices of cork and observed them under a microscope. He noticed partitioned boxes or compartments in the cork slice. These boxes appeared like a honey- comb. He also noticed that one box was separated from the other by a wall or partition. Hooke coined the term ‘cell’ for each box. 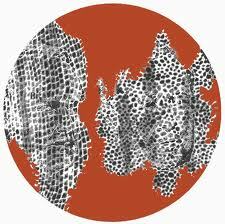 What Hooke observed as boxes or cells in the cork were actually dead cells. Cells of living organisms could be observed only after the discovery of improved microscopes. Very little was known about the cell for the next 150 years after Robert Hooke’s observations. Today, we know a lot about cell structure and its functions because of improved microscopes having high magnification. Both, bricks in a building and cells in the living organisms, are basic structural units. The buildings, though built of similar bricks, have different designs, shapes and sizes. Similarly, in the living world, organisms differ from one another but all are made up of cells. Cells in the living organisms are complex living structures unlike non-living bricks. The egg of a hen represents a single cell and is big enough to be seen by the unaided eye. Scientists use microscopes which magnify objects. Stains (dyes) are used to colour parts of the cell to study the detailed structure. There are millions of living organisms. They are of different shapes and sizes. Their organs also vary in shape, size and number of cells. Let us study about some of them. Can you guess the number of cells in a tall tree or in a huge animal like the elephant? The number runs into billions and trillions. Human body has trillions of cells which vary in shapes and sizes. Different groups of cells perform a variety of functions. Organisms made of more than one cell are called multicellular (multi : many; cellular : cell) organisms. The number of cells being less in smaller organisms does not, in any way, affect the functioning of the organisms. You will be surprised to know that an organism with billions of cells begins life as a single cell which is the fertilised egg. The fertilised egg cell multiplies and the number of cells increase as development proceeds. Both organisms are made up of a single cell. The single-celled organisms are called unicellular (uni :one; cellular : cell) organisms. A single-celled organism performs all the necessary functions that multicellular organisms perform. A single-celled organism, like amoeba, captures and digests food, respires, excretes, grows and reproduces. Similar functions in multicellular organisms are carried out by groups of specialised cells forming different tissues. Tissues, in turn, form organs. You may say that the shape appears irregular. 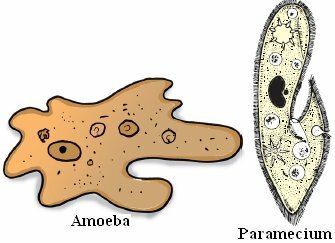 Infact, Amoeba has no definite shape, unlike other organisms. It keeps on changing its shape. Observe the projections of varying lengths protruding out of its body. These are called pseudopodia (pseudo : false; podia : feet). These projections appear and disappear as Amoeba moves or feeds. A white blood cell (WBC) in human blood is another example of a single cell which can change its shape. But while WBC is a cell, amoeba is a full fledged organism capable of independent existence. What shape would you expect in organisms with millions of cells? 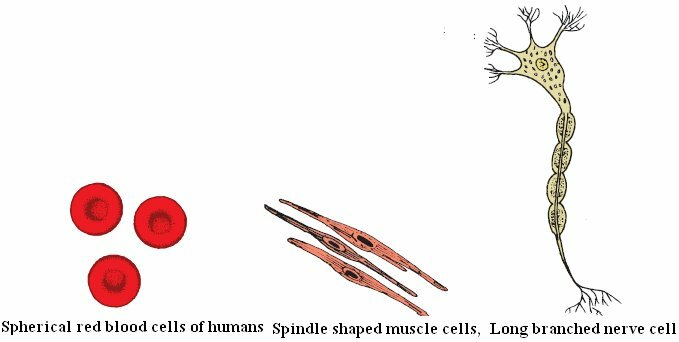 The picture shows different cells such as blood, muscle and nerve cells of human beings. The different shapes are related to their specific functions. Generally, cells are round, spherical or elongated. Some cells are long and pointed at both ends. They exhibit spindle shape. Cells sometimes are quite long. Some are branched like the nerve cell or a neuron . The nerve cell receives and transfers messages, thereby helping to control and coordinate the working of different parts of the body. Can you guess, which part of the cell gives it shape? Components of the cell are enclosed in a membrane. This membrane provides shape to the cells of plants and animals. Cell wall is an additional covering over the cell membrane in plant cells. It gives shape and rigidity to these cells . Bacterial cell also has a cell wall. The size of cells in living organisms may be as small as a millionth of a metre (micrometre or micron) or may be as large as a few centimetres. However, most of the cells are microscopic in size and are not visible to the unaided eye. They need to be enlarged or magnified by a microscope. The smallest cell is 0.1 to 0.5 micrometre in bacteria. The largest cell measuring 170 mm ×130 mm, is the egg of an ostrich. Boil a hen’s egg. Remove the shell. A white material surrounds the yellow part. White material is albumin which solidifies on boiling. The yellow part is yolk. It is part of the single cell. You can observe this single cell without any magnifying device. The size of the cells has no relation with the size of the body of the animal or plant. It is not necessary that the cells in the elephant be much bigger than those in a rat. The size of the cell is related to its function. For example, nerve cells, both in the elephant and rat, are long and branched. They perform the same function, that of transferring messages. Organs are made of still smaller parts. The smallest living part of an organism is a ' cell '. Cells exhibit variety of shapes and sizes. Number of cells also varies from organism to organism. Some cells are big enough to be seen with the unaided eye. Hen's egg is an example.